Grapes up close have so many different colors and such a translucent quality. Painting these challenged me to keep the colors clear. With too much blending, mud happens very quickly. The painting is 5x7 inches on a Raymar panel and can be purchased for $50.00 plus $6.50 for shipping to US addresses by clicking on this link. The Raymar Panels I ordered last week came in and tempted me to use them all up in one day! I always liked the texture of canvas, but have not been particularly fond of stretched canvas for a number of reasons. These little panels are perfect. When just ordering ten panels, the price seemed a little steep for 5x7 inch panels, but when I ordered more, the postage cost increased very little and made for a very reasonable purchase. I may never prepare my own panels again! Yesterday's painting, Red and Green, focused on glazing, a practice I do less often than I used to. Because I liked the results, I added this little painting to my recent glazing efforts. Usually I paint wet in wet, probably because I have a short attention span and am impatient. Glazing requires a dry surface, so patience is required as each layer dries and waits for a new layer of paint. That is why I seldom glaze anymore--definitely too impatient. But pulling out older works that didn't meet my satisfaction has been quite productive. This painting was not changed at all except to add an additional layer of color to each of the pears. They are brighter and the color has a lot more depth after adding the glaze. I suppose I should develop more patience because glazing really does produce delightful results. After looking at a painting created several months ago that wasn't working for me, I took a brush to it and did some glazing. 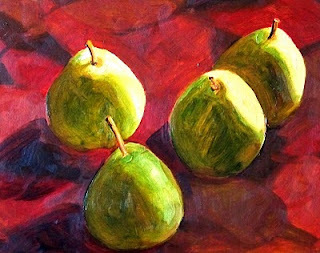 This 8x10 inch oil painting started out with an attempt at painting pears with some intense backlighting. 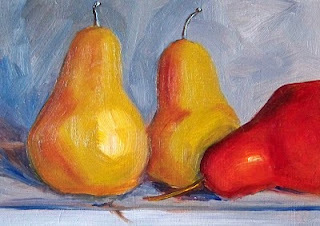 The pears were originally yellow, but getting a dark value of yellow on the shadow side of the pears wasn't very successful. I glazed over the yellow pears with sap green and suddently they looked much better. The values became darker and the contrast much more effective in addition to the combination of the red and green. I'm glad I took a chance and played with this one before discarding it in the reject heap. 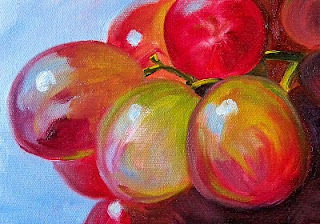 Here is another one of my wintertime fruit paintings. I love the combination of warm and cool colors, especially in the winter when everything seems drab and gray. This painting is a tiny 4x6 inch oil painting, just the size of a little snap shot, and just small enough to fit in a little photo frame. 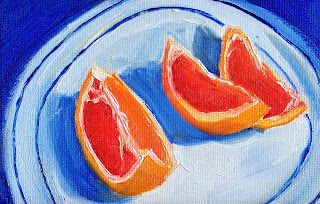 It is sitting on a drying rack waiting to make its entrance into my Etsy Shop, Small Impressions Paintings, where it will join some of my other brightly colored fruit paintings. Yesterday morning I painted this little 5x7 inch oil painting. I was attracted to the cold, winter sky and the silhouette of the tree on the shore of the lake. I found the photo on which the painting was based at Morgue File, a wonderful resource for free photos. The license at Morgue File gives artists permission and a lot of leeway in adapting photos, so I visit often to find inspiration. Eventually I will place this painting up for sale at Small Impressions Gallery with some of my other small landscape paintings which can be purchased online with just a few mouse clicks and a Paypal account. Click here to view my paintings. Today's painting was a huge challenge keeping all those tires the right shape and not getting tangled in all the bicycle frames. There were several points where I almost wiped it out, but resisted. There's plenty to pick about, but I'm happy it reached a state it can pass as finished. After I put the last few strokes on it, I went for a bike ride of my own. 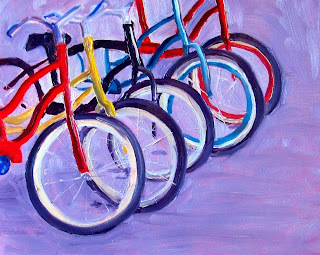 After 30 miles, the stress of painting these bikes floated away and I had a wonderful afternoon. I thought this owl painting was completed several weeks ago when I sat him on my drying rack. As the paint dried, he just didn't seem right. Something was missing; I didn't like him. Then this morning, while working in my studio on some cleaning tasks, it came to me. He needed a glint in his eyes. I added a glint to each eye and now I like him again. It is amazing how those two little white dots in the pupils made the difference. Owl faces are really fun to paint. 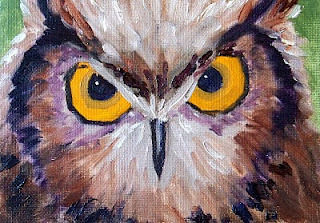 This guy is a good little partner to another owl painting I created a while back. I may have to paint a flock of these little wise guys. 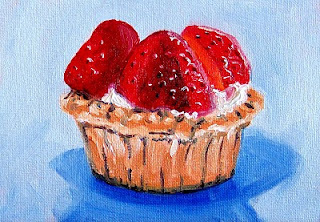 Just a little strawberry tart--5x7 inches--professional grade oil paint and a lot of fun to paint! Choosing the best surface for painting is something I am always exploring. There is such a wide range of options. Some of them quite economical and some of them very expensive. I try to balance price and quality. For a long time I've prepared gessoed hardboard panels myself. They are good quality and will last a life time. I never have concerns about selling my paintings that are produced on the panels I make myself. The drawbacks are that they take quite a bit of time to construct and the surface is slippery, unlike painting on canvas. I've stretched my own canvas and purchased pre-stretched canvas. I love the texture of canvas, but it isn't as sturdy as the hardboard panels. I've covered hardboard panels with canvas, and they are very good quality, but it is a lot of work with too many steps. I tend to be rather impatient and would rather paint than prepare panels. I've purchased canvas panels from a number of sources with a wide range of quality. Some are better than others. Today's painting is 5x7 inches on a very cheap canvas panel. I will never paint on a panel of this quality again. It was such poor quality, it felt like I was painting on paper; I'm sure it will disintegrate within a few years. It is a shame, because the painting didn't turn out too bad. There are some decent quality canvas panels, but this was not one of them. Lesson learned--don't skimp on materials! Maybe I'll put it in an E-bay auction for 99 cents or donate it to a worthy cause. What do you think? This little 4x6 inch painting is another of my little Pacific Ocean Paintings. It was inspired by damp, foggy coastal mornings. Looking up at the sky and searching for a patch of blue is my way of hoping the sun is going to shine and the day will be clear and bright. Sometimes it actually happens. The other little painting from my recent trip was posted a couple of days ago. Both provide a nice little memory of a delightful weekend, and we actually had some sunshine! 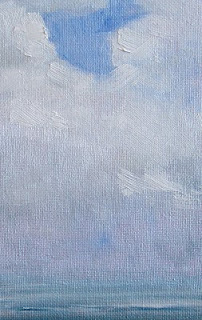 Today's painting is 5x7 inches on a canvas panel. 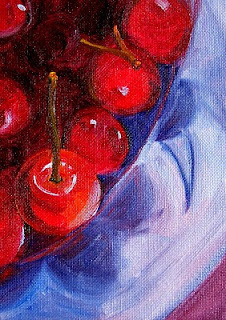 As I painted, my focus was on those highlights near the stem of that one cherry. 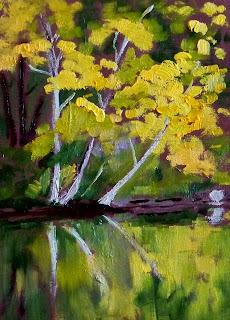 Paintings with highlights in exactly the right position always attract my eye, so I was hoping to come close to the right position. High swells and high tides made Valentines Day an exciting day to visit the Pacific Coast. After a day of pouring rain, the sun finally came out. Coupled with a high tide plenty of 22-24 foot waves splashing and crashing it was quite an exciting day. I had to create a little painting to comemorate the occasion. 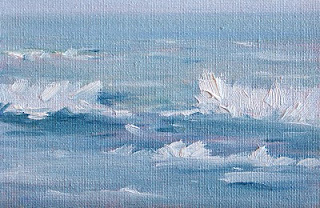 In comparison to the huge waves, this little painting is just 4x6 inches. When travelling, it is easy to just throw a few of these little canvas panels in my paint box and I never miss a day of painting! Today's painting was created with a couple of new paint brushes I recently purchased. The brushes are a No. 4 Blick Materstroke Bristle Flat and a No. 4 Silver Grand Prix Bristle Flat . I'm on a never-ending quest for the perfect brush. I suspect these two brushes are manufactured by the same company and sold under different labels. They appear to be identical except for the color of the handles. Both have wonderfully springy bristles of exactly the same length and width that hold their shape well. Both have the same copper colored ferrules of exactly the same shape and size. If it wasn't for the different colored handles, I wouldn't be able to tell the difference. And I love them both! The delimma will be when I purchase more, which one will I pick? The painting is 5x7 inches on a hardboard panel and was a pleasure to paint with my wonderful new brushes! Soon it will be for sale at Small Impressions Gallery along with some of my other small landscape oil paintings. 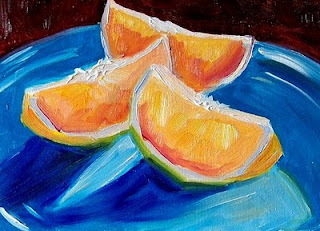 Painting a dish of citrus with bold strokes was my approach to this painting. While I enjoy looking at work that is photo realistic, I don't have the discipline to spend long hours on a painting. Fast and loose is a lot more fun. I like bright colors and big brushes. 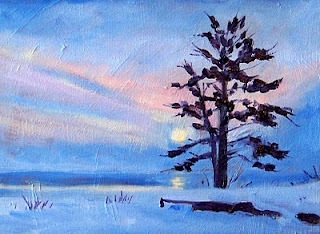 This painting is 5x7inches on a hardboard panel and painting it was a great escape! A cat hasn't been part of my family since I was about five years old and lately my household enjoys the company of dogs. 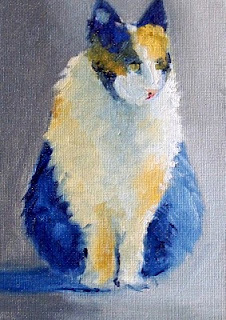 In spite of this, when I saw this fat little cat, I couldn't help but paint her. She stood primly with her feet together looking very lady like. She was wide and fluffy, sweet, and serene. She's quite a gal and it will be fun to have her portrait sit on the mantle in my living room for a while pretending to be part of the family. Today's painting reminds me of one of my favorite publications, The Onion, a satirical online publication. If you've never read The Onion, you are missing some great writing and more than a few laughs. The metaphor which comes to mind with the title of the magazine also brings to mind the idea that I need to laugh at misfortunes and not take myself too seriously. This past week, the power cord on my laptop began shorting out. If I jiggled it, I would get power, but it kept shifting back and forth between battery and the AC current. Finally last night, the cord gave up completely. Running on battery alone, panic set in. With apprehension and nervousness, I backed up my hard drive, hoping to avoid the loss of all my photos and documents. I spent the evening trying to locate a replacement power cord. Even though I had backed up my hard drive, a lump was forming in my stomach. Would I lose my data? Will I have to buy a new computer? How much is it going to cost? Can I afford it? No cord available at the local stores--the machine was too old. Nothing online--all searches at the company's web site indicated there was no replacement part available. Nothing available by phone--business hours ended at 5:00 p.m. All smelled pretty bad, like onion on the breath of an old dog. Darn technology!!! But, after a good night's sleep, a laugh at myself, and a telephone call, a replacement power cord is on the way. The moral of the story is that I have to remember not to take life too seriously, read The Onion on a regular basis, and paint my days away. 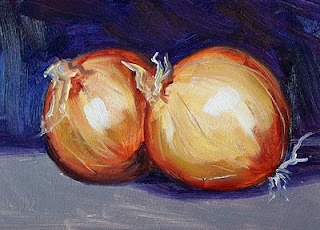 Today's painting is 5x7 inches on a gessoed panel and it felt pretty darn good to be painting onions! 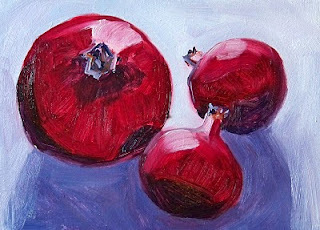 Today's little 5x7 inch oil painting was inspired by the beautiful red of a group of pomegranates. The luscious red, the reflected light, and blue shadows combined to get me going on this painting. 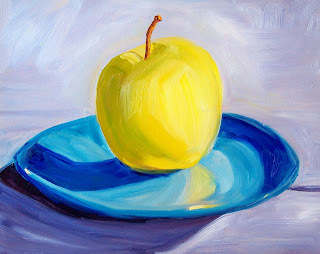 Eventually I will sell it, but for now it will grace my dining room along with some of my other small fruit paintings. That's the nice thing about being a painter, there's always paintings blessing my walls! 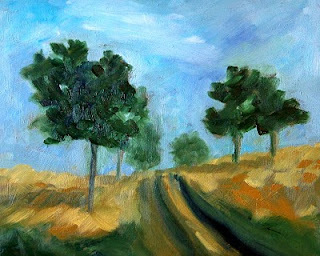 Today's painting is not only another landscape, but one on the theme of travelling down a road. 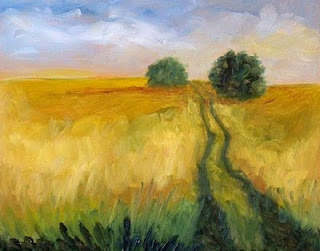 This painting was inspired by the vastness of prairies. In a sense looking across a prairie is like looking at the ocean. They seem to have no end even though we know logically that they are just wrapping around the curve of the earth. This painting is 8x10 inches on a gessoed hardboard panel. Abstract landscape paintings have been sneaking off my brush lately. I'm not really sure what has prompted it. Perhaps it I'm just returning to an old friend. My paintings used to be almost all landscape paintings, then I moved into still life and some animals. Maybe it is my short attention span that just moves along in a random manner. Nonetheless, today's painting is an 8x10 inch oil painting on a gessoed hardboard panel. It was fun, quick, and colorful. 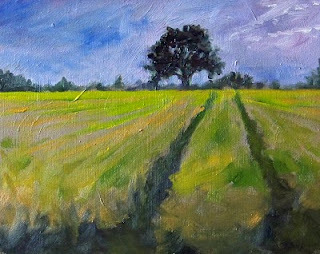 I'm looking forward to it joining some of my other landscape paintings at Small Impressions Gallery in the near future. After listening to the plight of folks living on the East Coast of the United States, I'm feeling especially lucky. With snow piling up there, I almost feel guilty admitting that for those of us living in the Pacific Northwest, we've just experienced one of the warmest Januaries on record. Today I not only had a chance to paint with brilliant sunshine flowing through the window, I was also able to take a trek on my bicycle and feel the warmth on my back. Today's painting is 8x10 inches and demonstrates the good weather and sunlight I've been so fortunate to enjoy today. 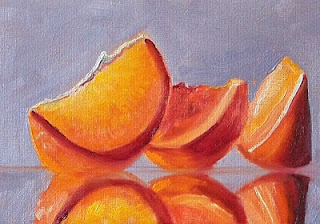 The painting will join some of my other still life oil paintings at Small Impressions Gallery in the near future. While it dries, I'm going to soak up some sunshine. So, I seem to be obsessed with citrus fruit of late. I love the colors; I love the shapes; I love the fun. Oranges, lemons, limes--it doesn't seem to matter. Perhaps it is the winter dreariness that drags me toward these sunny little fruits. Perhaps it is the way I can play with their shapes, reflections, and the shadows they cast. Perhaps it doesn't matter because I'm having some good fun with them. Who knows? What I do know, is that this one has just entered Small Impressions Gallery and can be purchased for $35.00 plus $6.50 for shipping to US addresses. It was created on a canvas panel with professional grade oil paints and would make a great little piece of art for a kitchen in need of some color. Unfortunately, my kitchen is overflowing with art and I have no more room on my walls, so I'm willing to share! Click here to add it to your shopping cart. 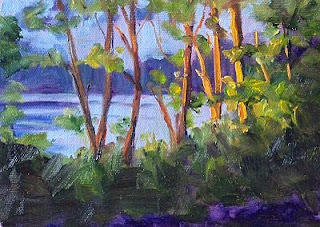 While I was dreaming of warm weather in my last painting, the reality of the environment must have been percolating on the back burner of my mind. This 8x10 inch oil painting emerged from my brush and presented a stormy atmosphere much like what is happening right now, just outside my window. 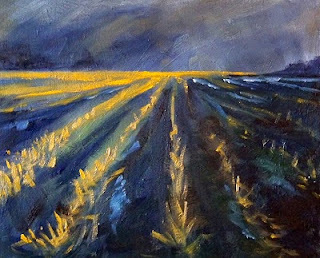 Even though the painting reflects a darker side, I enjoyed creating the abstraction and the sense of fading light on the wheat of a rural field. This painting will eventually find its way to the Small Impressions Paintings Gallery where some of my other small landscape paintings currently reside. Walking through this field on a warm summer day is where I want to be right now. This painting reminds me of leisurely summer days and makes me want to step right into it. It is 8x10 inches on a gessoed hardboard panel, but I'm really tempted to paint a larger version of it--the bigger the better. As it is, I can't quite fit myself through the opening--maybe a a bigger picture plane would allow me to hoist myself into the scene. Do you think it will work? Maybe a size like 24X36 inches? Maybe I would fit. I do wish it were so. There is so much fun in dreaming. 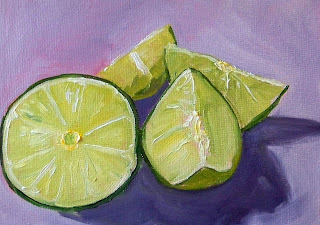 Yesterday I posted my little "Lime Gathering" painting and today I continue with the abstraction these little bits of fruit can create. A very light wash of alizarin crimson began this painting. Then I played around with shapes, arranging and rearranging the the pieces and playing with shadows. When it pleased me, I added some color over my initial wash. Working on this little series is turning out to be a lot of fun, and I've taken a liking to violet and green! 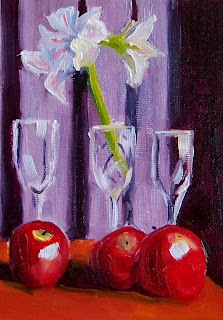 I have added this painting to my Etsy Shop, Painting Small Impressions, where they will join some of my other small still life paintings. It can be purchased for $35.00 plus $6.50 for shipping to US addresses. Click here to put it in your shopping cart and have it sent to your home.